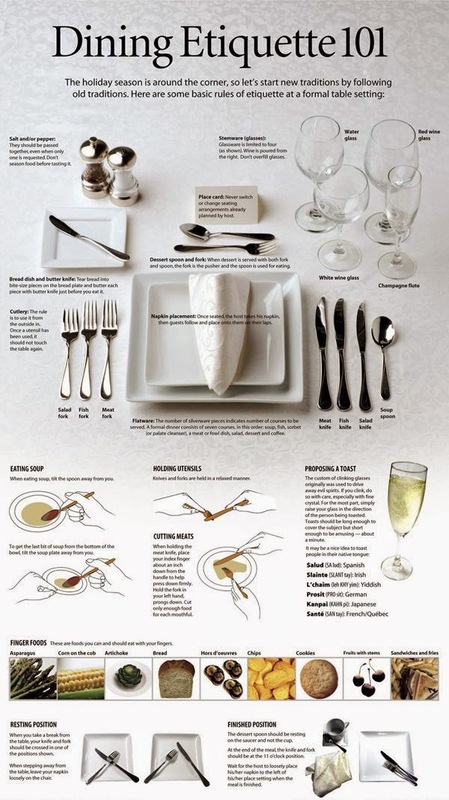 I love it when I come across these delightful etiquette cheat sheets, especially ones like this sample place setting that removes all fear and apprehension out of setting a formal table. It even lets you know what is okay to gracefully 'attack' with your fingers and how to properly rest your utensils on your plate to signal that you are done! Your table never has to be uppity and formal to enjoy breaking bread with others but knowing where everything should go (if you choose to use) is always the place the start. Of course, paring down the set up above is a great idea for dining that is less formal and if you are removing something from the placement, just slightly move everything in towards the dinner plate. My mother-in-law has something just like this tacked up in her pantry! I love these cheat sheets too! I still won't eat Asparagus with my fingers. Socially acceptable or not, it just feels strange to me. Enjoy your weekend!